90% of all disasters are related to weather, climate and water. WMO coordinates the activities of countries around the world in producing, exchanging and using information about weather, climate and water. The ultimate goal of WMO is to promote safe and sustainable development and help protect the planet for present and future generations. WMO has 191 Member States and Territories (as of January 2013). Click here to see if your country is one of those members. WMO is a specialized agency of the United Nations. 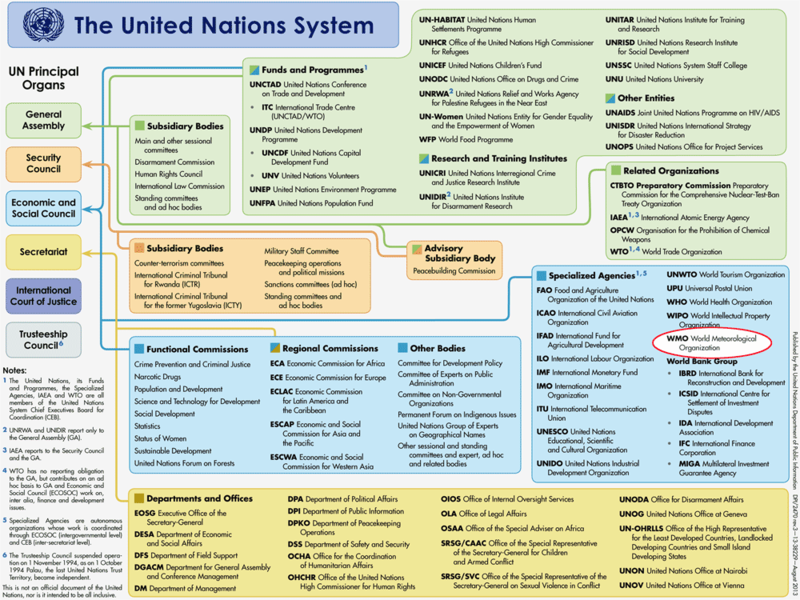 It is part of the United Nations system, but as an independent organization with its own rules, membership, and resources. Meteorology uses physics, mathematics and chemistry to understand the atmosphere and its phenomena, including weather and climate. No one can really claim to be the first meteorologist. Predicting the weather has always been essential to humanity's survival. Long before modern science, watching the sky and other methods like observing the flight of birds were ways of predicting the weather. As societies developed, however, humans began to study the weather and seasonal changes in the wind (such as the monsoon), which were essential for travel or trade and their subsistence. Records of early civilizations contain innumerable references to weather and climate. It was not until 1657, however, that Grand Duke of Tuscany Ferdinand II di Medici established the first recorded international meteorological network. His Accademia del Cimento set up seven weather stations in Italy, and one each in France, Germany, Poland and Switzerland. Weather, climate or water-related phenomena cause hazards such as drought, floods, windstorms, tropical cyclones, extreme hot and cold temperatures, landslides and wildfires; and are also linked to diseases like malaria and infestations of insects such as locusts. Weather and climate ignores political borders. When you cross from one country to another, it does not stop raining just because you have crossed the border. All nations, therefore, have to cooperate to develop their meteorological skills and to predict the weather. Information needs to be exchanged quickly and freely around the globe. For this reason, WMO was created. It coordinates the activities of the National Meteorological and Hydrological Services of its Members. Imagine all the weather, water, climate and other environmental processes going on in the world. No single organization could make sense of them all on its own. These are the national weather, water and climate agencies that collect, analyze and share information such as weather forecasts. WMO Members usually appoint the head of these national services to be their representative at WMO. These include other United Nations organizations and intergovernmental agencies, as well as international non-governmental organizations. This includes researchers and scientists leading meteorological-related studies. Radio and television and media sources on the Internet are the main channels for people to get weather-related news, advice and warnings. Weather forecasts are among the most popular television and radio programms – and all smart phones come equipped with a weather app. WMO partners with the media to accurately present weather and climate information to the public. Weather, climate and water affect business and economic sectors such as transport, aviation, construction and tourism in many ways. The private sector is both a producer and a user of weather and climate services. WMO and its Members work to ensure that the private sector gets the best possible information to maximize efficiency and safety. WMO was created in 1950 and is headquartered in Geneva, Switzerland. It became a specialized agency of the United Nations system in 1951. For more than 60 years, WMO has worked to increase understanding of weather and climate systems. It has strengthen provision of information on the state of the Earth's atmosphere, oceans and freshwater reserves. WMO and its Members will continue to work together to find global solutions to global problems, to protect populations around the world and to preserve our planet for future generations.